Compus Interviews are conducted by the companies, especially, IT companies, in the Engineering colleges to select candidates for the jobs in theri organisations. To be secufssful in the Campus interviews , the candidates have to develop good communication skills in English besides that, they have to acquire excellent analytical and reasoning and quantitative abilities. 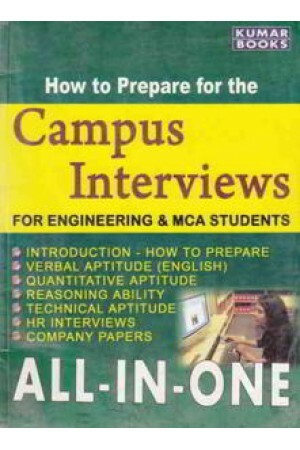 this book 'How to prepae for the compus interviews' which is the first of its kind, is designed to help the candidates for preparing compus interviews, it tells then what are compus interviews, how they are conducted , how to prepare for them and what are the essential things the candidates have to do to be successfl in the Campus Interviews. It also provides exhaustive study material and practice tests on various topics dealt in the written Test and H.R. Interviews. this is an All-in -One book, which consists of Six Sections.1. Section one is introduction 2. Verbal Aptitude(english) 3. Quantitative Aptitude 4. Reasoning Ability 5. Technical Aptitude 6. HR Interviews 7. Company Papers.